Ideally, all this we have listed in this section should be in their respective time periods, F&I in the 1600-1800 Time/Area, Fur Traders/Trappers in 1800-1860, Native American Reenactors and Trekking in both. However, to us, it just seems logical to put "like-stuff" with like-stuff! Look for this area to really shine soon, book mark it and keep comin' back as it is only going to get better!! The person in charge of the Frontier Period area here at reenactor.Net is Bonnie (blnzrfn)! If you have a site that needs to be listed in this area, please contact Bonnie at this e-mail: blnzrfn2000@yahoo.com. Please, feel free to look around and suggest stuff! Pix from events are always appreciated! 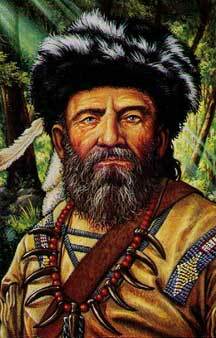 What IS a "Mountain Man"
The term "Mountain Men" is used to describe trappers and explorers who roamed the North American Rocky Mountains from about 1810 through the 1860s (with a peak population in the early 1840s). These men were instrumental in opening up the various Emigrant Trails (widened into wagon roads), which allowed Americans in the east to settle the new territories of the far west by organized wagon trains traveling over roads explored and in many cases, physically improved by the mountain men and the big fur companies, originally to serve the mule train based inland fur trade. 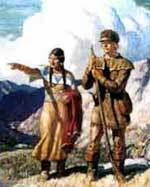 Before there were "mountain Men" out in the Rockies, trapping beaver, there were the "Longhunters"...Longhunter (or long hunter) was an 18th-century explorer and hunter who made expeditions into the American frontier wilderness for as much as six months at a time. 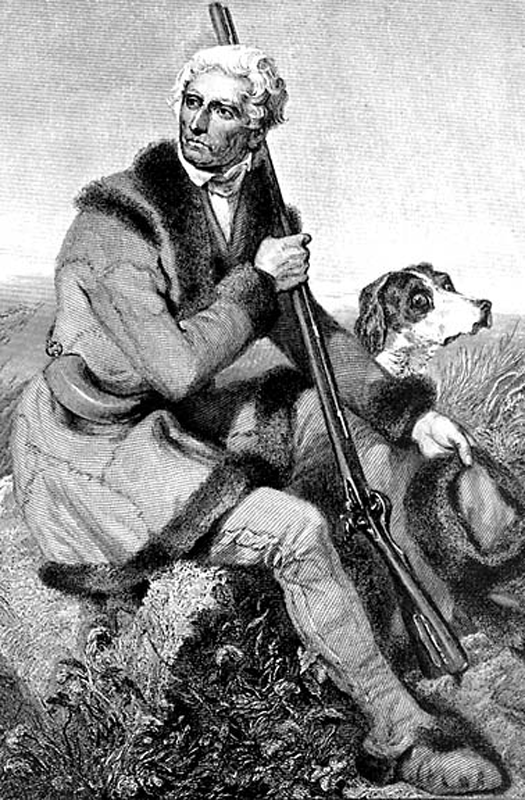 Historian Emory Hamilton asserts that "The Long Hunter was peculiar to Southwest Virginia only, and nowhere else on any frontier did such hunts ever originate" although the term has been used loosely to describe any unofficial American explorer of the period. Most long hunts started in the Holston River Valley near Chilhowie, Virginia. The hunters came from there and the adjacent valley of the Clinch River, where they were land owners or residents. The parties of two or three men (and rarely more) usually started their hunts in October and ended toward the end of March or early in April. The information gathered by longhunters in the 1760s and 1770s would prove critical to the early settlement of Tennessee and Kentucky. Many longhunters were employed by land surveyors seeking to take advantage of the departure of the French from the Ohio Valley at the end of the Seven Years War. Some later helped guide settlers to Middle Tennessee and southeastern Kentucky. Today, there are many (especially in the East) who try to emulate these hunters. We will have more on this as we go along. Historical reenactment of the dress and lifestyle of a mountain man, sometimes known as "buckskinning," allows people to recreate aspects of this historical period. Today's' Rocky Mountain Rendezvous and other reenacted events are both history-oriented and social occasions. Some modern men choose a lifestyle similar to that of historic mountain men -- they may live and roam in the mountains of the west or the swamps in the southern United States. 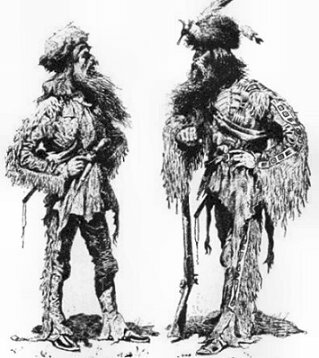 The stereotypical mountain man has been depicted as dressed in buckskin and a coonskin cap, sporting bushy facial hair and carrying a Hawken rifle and Bowie knife, commonly referred to as a "scalping knife." They have been romanticized as honorable men with their own chivalrous code, loners who would help those in need but who had found their home in the wild. have a web page for your unit/group this is important! Click here to go to the Frontier site listing form! Fill out the form--completely please!